The Edward Caswall translation, altered. Source: "In Excelsis” (Century Co., 1897), #214 , pp. 162-3. Text only; no music. See below. Veiled beneath a form of earth. Gifts of incense, myrrh, and gold. Myrrh the future tomb foreshows. Sheet Music "Morning" by J. B. Dykes from William Cooke, et al, eds., The Hymnary (London: Novello, Ewer & Co., 1872), #166, p. 140. 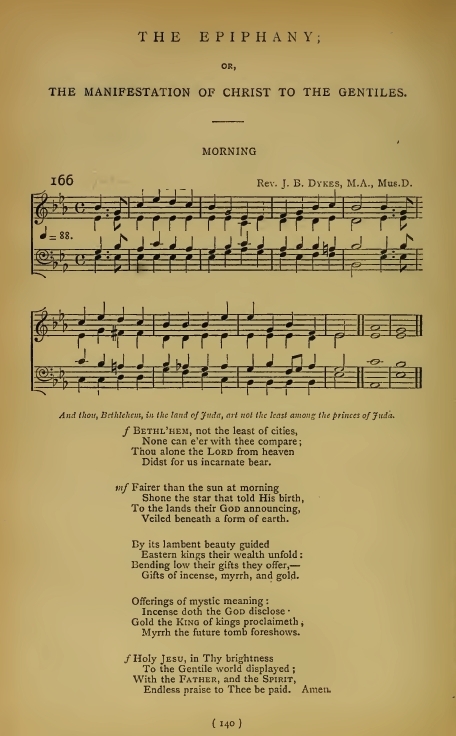 This hymnal is also found in the Internet Archive: In Excelsis. A copy is also available from the Internet Archive: The Hymnary. No copy of that hymnal was available from Google Books.